I’ll be honest with you, this recipe was born out of a disaster. I had intended on making cheesecake jars but totally misjudged the amount of ingredients and the cheesecake ended up looking silly, only filling about a third of the jar. But it was SO delicious and I didn’t want it to go to waste, so I transferred it to a bowl to enjoy for myself. I stirred it into a messy mixture and it was divine. And you know what?? I think it turned out better than the cheesecake jars would have! 2. You have the cheesecake “filling” which is simply raw cashews, a tiny bit of agave, vanilla and lemon – you’ll be surprised how much this actually tastes like a rich cheesecake! 3. Then there is the sharp, fruity topping which is just pure strawberries. I pureed half of them and chopped the rest into small pieces. 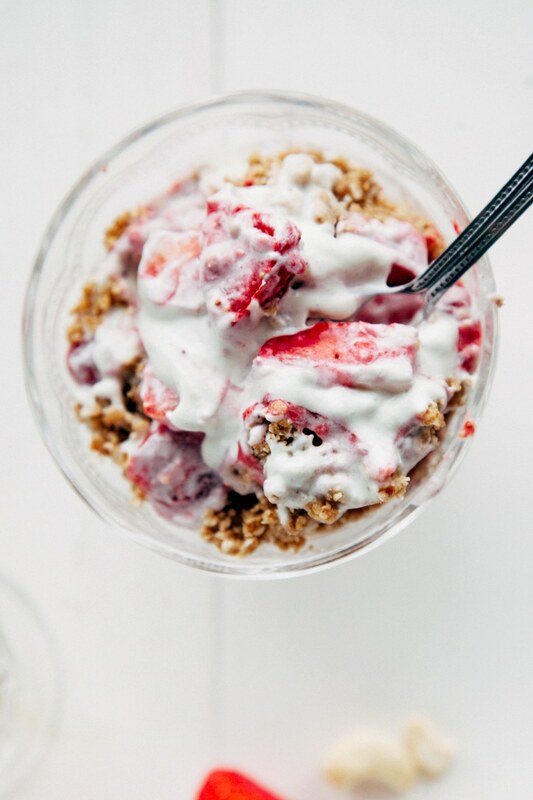 It’s so simple and wholesome yet tastes like heaven and is healthy enough for breakfast! Move over Eton Mess... 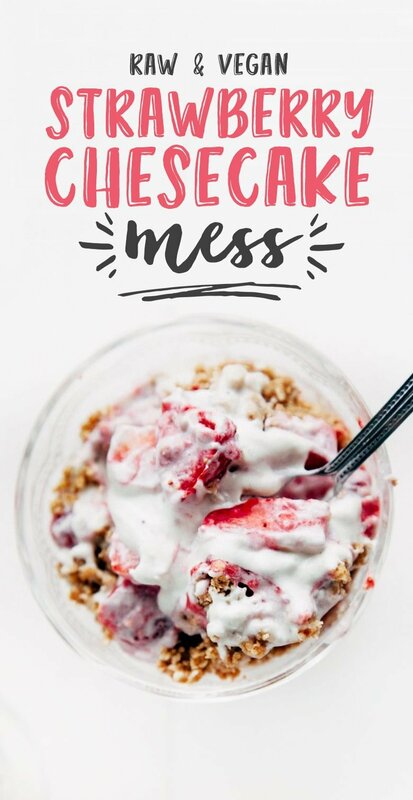 It's all about the Cheesecake Mess now. 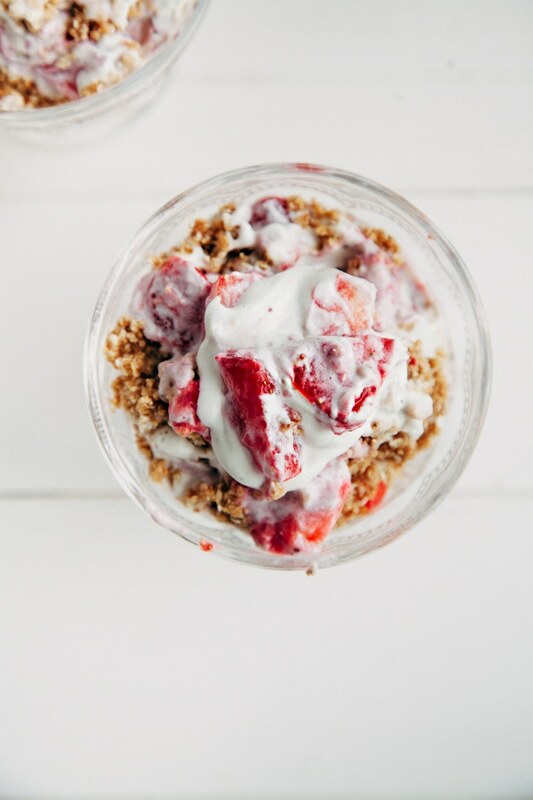 This quick & easy dessert is so healthy you could even have it for breakfast! Make the base by adding the oats to a high powered blender or food processor and blending with the medjool dates. Add a small bit of water until it forms a dense, crumbly mixture. Divide the mixture between two small bowls or glasses. Rinse out your blender and make the filling by blending all the ingredients until smooth. Again, divide the mixture between the two bowls. Finally, chop half of the strawberries into small pieces and blend the remained into a puree. Add to the bowls. Gently stir everything together to create a messy (but delicious) mixture! Serve and enjoy! 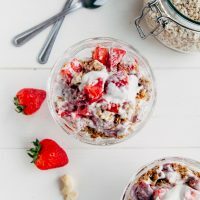 The mess can be kept covered and refrigerated overnight to enjoy the next day but note that the texture will be much softer, like overnight oats. 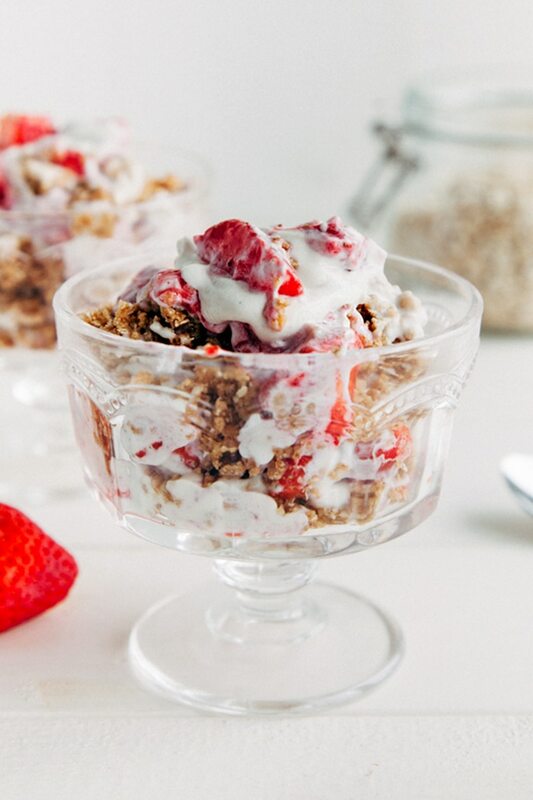 This would be the perfect snack / breakfast / dessert to watch Wimbledon with! Do you follow it? I love it when a baking mishap results in something even better than what was planned! Great save, it looks fantastic! Thanks Kelly! I'll swap you a serving for one of your amazing berry creations? Haha, I think that's true - you can't go wrong with these ingredients, can you? Thanks Kate! See, I think YOU make the best vegan desserts! I would absolutely love to meet and do a foodie collab one day! You're in Manchester, right? A mess never looked SO GOOD! Thanks Sarah! Yes, thankfully something delicious can come out of a recipe disaster! Very well saved! 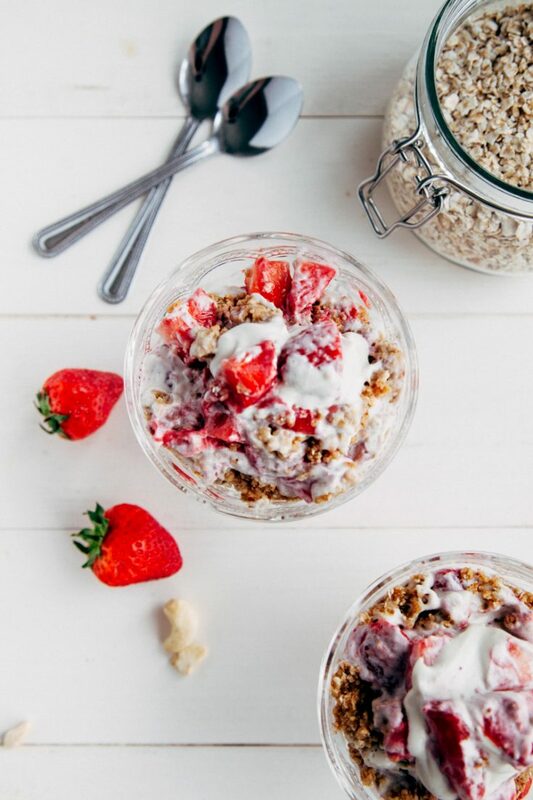 This still manages to look pretty, even mushed up in a jar - I think fresh strawberries can save anything ;) I don't follow Wimbledon at all but I will take any excuse to eat strawberry desserts. Well... I've definitely had some unsaveable disasters :D but on the whole, I usually eat everything I make, even if it goes wrong! I'm starting to see that's true, Mara!